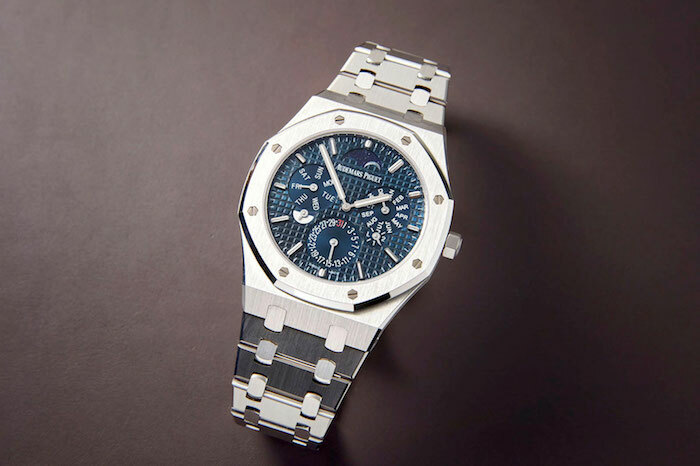 Although Audemars Piguet debuted more than a dozen new watches at SIHH, the three showstoppers this year were riffs on its best-selling Royal Oak collection. These incorporated a good deal of technical novelties whilst commemorating the savoir faire (technical and otherwise) that AP is renowned for. 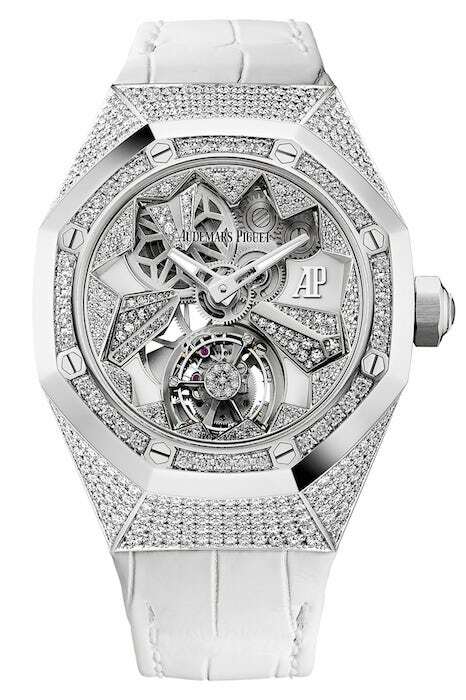 Put simply, AP’s 2018 releases include a record-breaking redesign, anniversary release and haute joaillerie/concept watch hybrid. How’s that for variety? At a thickness of just 6.3mm — even surpassing the dimensions of the vaunted Extra-Thin Jumbo — the RD#2 has won AP the title for “world’s thinnest automatic perpetual calendar”. 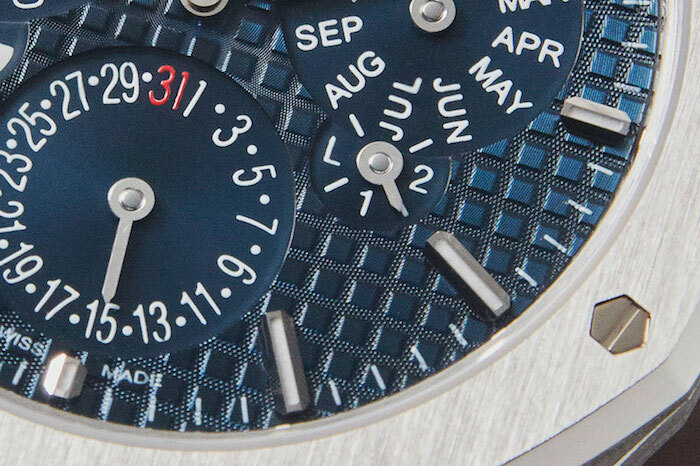 The culmination of a five year long R&D project, the RD#2 required the brand’s designers to radically rethink the layout of perpetual calendar wristwatches. AP had traditionally produced its perpetual models with a three-level movement, wherein each “level” housed mechanisms powering a discrete function. AP literally flattened this structure by building components capable of powering multiple functions simultaneously. In that vein, the RD#2 sports an all-new date wheel which combines four different gradations of depression to represent the various 28 to 31-day months. They’ve also seized upon the notion of utilising dials to support the movement (not unlike another prominent ultrathin watchmaker), with this model’s dial essentially doubling up as a main bridge for the attendant calibre 5133. The net result is a wristwatch less than a third the thickness of most conventional perpetual calendars. Unfortunately, at time of publication, it remains unavailable for commercial purchase. 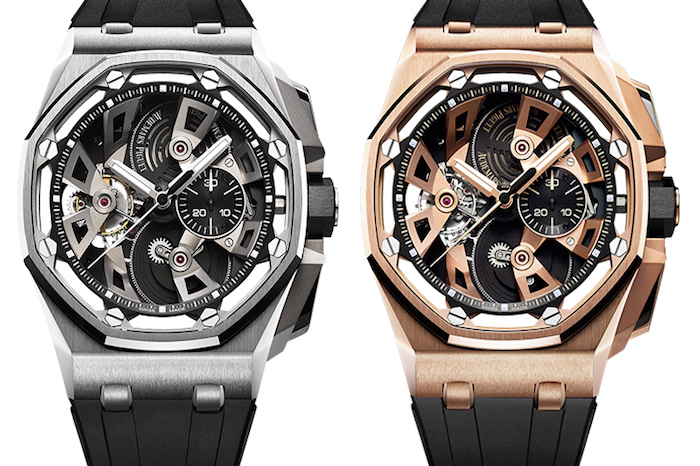 The new Offshore Tourbillon Chronograph is available in two iterations: steel or rose gold. Slightly more attainable are two new iterations of the Offshore Tourbillon Chronograph — released to celebrate the 25th anniversary of Emmanuel Gueit’s updated Royal Oak design. Available in steel or 18k pink gold, this year’s additions to AP’s line of Offshore Tourbillon Chronographs crib heavily from the ref 26388 — the inaugural Offshore launched in 1993. Its thin bezel accentuates eight hex screws which are set around an equal number of open worked bridges. When viewed in top down profile, the latter give the impression of being suspended over the underlying calibre 2497. This movement includes features such as the 30 minute chronograph (3 o’clock); tourbillon (9 o’clock); and double mainspring barrels which feed a meaty 7-day power reserve. Despite subtle nods to the original Royal Oak Offshore, the Tourbillon Chronograph is a decidedly modern timepiece. Highly selective deployment of skeletonisation combined with a 45mm case diameter ensure that the new steel and pink gold releases will wear prominently on most wrists; and — in keeping with the Offshore’s sport watch provenance — come standard with water ready rubber straps. When viewed in top-down profile, the Royal Oak Concept’s invisible setting is intended to invoke the icy vistas of the Vallée de Joux. Though the RD#2 project is the brand’s flagship concept, AP wanted to shake things up this year with an equivalent release dedicated to its female clientele. 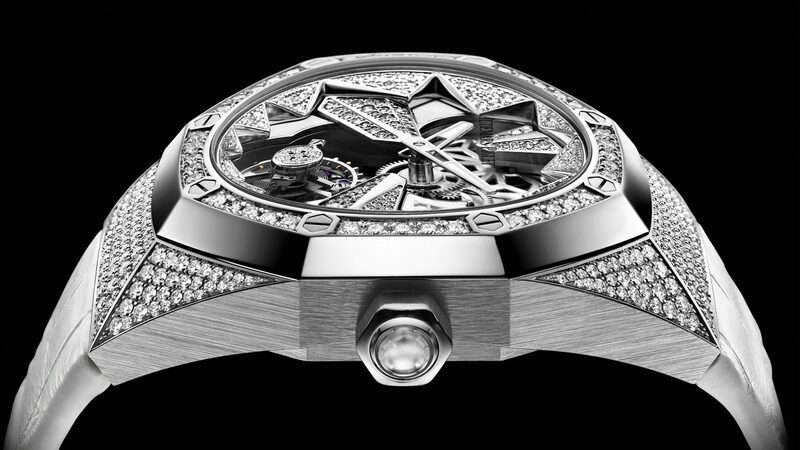 Enter the Royal Oak Concept Flying Tourbillon. Available with brilliant or baguette cut diamonds, the Concept Flying Tourbillon is serious mechanical watchmaking mixed with equal parts aesthetic verve. Invisibly set “icicles” in the white lacquered dial are calculated to evoke the snowy peaks of the Vallée de Joux — the spiritual heartland of Swiss horology. The winter wonderland theme is driven home with the inclusion of a barrel (at the 11 o’clock position) reminiscent of a giant snowflake. The Royal Oak Offshore Tourbillon Chronograph is available in a limited run of 100 pieces (50 in stainless steel and 50 in 18k pink gold). Prices are available upon request. The Royal Oak Concept Flying Tourbillon is priced between US$190,420–$395,870. For more information about AP’s new releases, visit their official website.